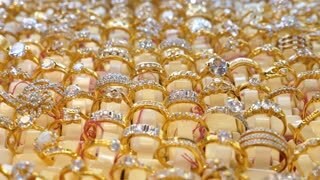 Search Results for "engagement rings"
Gold engagement rings on beige background. Wedding Rings. Two splendid wedding rings on a wedding day. Two wedding rings on the table. Marriage and Engagement Rings of a bride close up shot of her hands. Engagement rings falling on the floor. Slow motion.